With El Nino in effect, we’ve been getting a few chilly and rainy days here in SoCal, so I’ve been using that as an opportunity to whip up some tasty, hot soups and chilis. Since I am making it a goal to eat less meat, I’ve been really into making new Weight Watchers vegetarian recipes, and this Vegan Quinoa Chili was a hit! By simply substituting quinoa for the meat, I was able to put together a super easy chili that tastes just as hearty and delicious as a traditional, meat-based chili. The quinoa and beans provide a lot of protein and fiber, so this chili will definitely leave you feeling full and satisfied. Feel free to add your favorite fixin’s on top like cheese, sour cream, diced red onion, avocado…whatever your heart desires. Just make sure to add them into the total Smart Points value! This chili also reheats and freezes really well, so make sure to store some extra in the freezer for lunches or quick weeknight dinners. Enjoy! Enjoy this hearty, vegan chili with your favorite salad or cornbread for a deliciously guilt free meal. 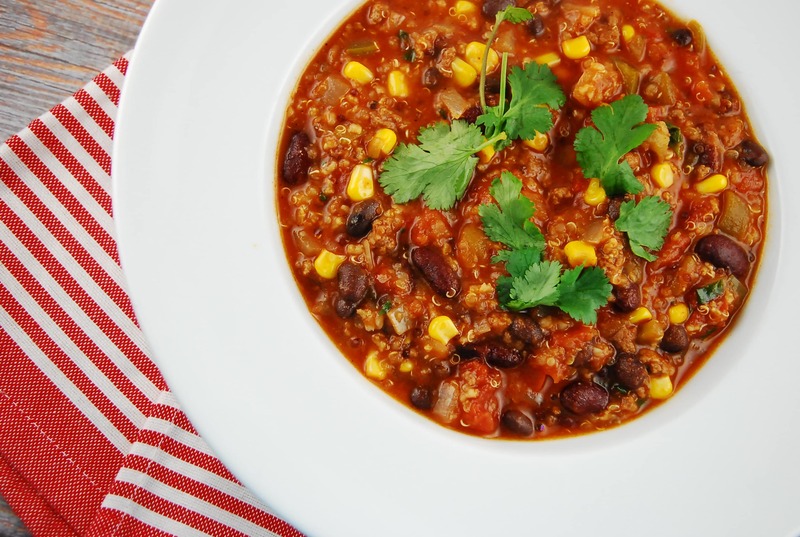 Even meat lovers will have a hard time denying how tasty this healthy chili recipe is! Heat oil over medium high heat in a large pot or dutch oven. Add in onions and garlic and sauté until fragrant, about 2 minutes. Add in diced tomatoes, tomato sauce, chilies, quinoa, chili powder, cumin, paprika, and about 1 1/2 cups of water. Season with salt and pepper as desired. Bring to a low boil, then reduce heat to low. Cover and cook for about 30 minutes. Stir in beans, corn, cilantro and lime juice. Heat for another 5 minutes, then serve immediately.